I have been a commercial sculptor for over 30 years working on licensed characters for toys and gifts. The final products ranged from chocolate and plastic to crystal and bronze. In recent years I have also worked in the ephemeral arts of sand and pumpkins, co-starring in a TV showon the SyFy network called "Carvers" and appearing on episodes of Halloween Wars and The Rachel Ray Show. Last year I had the pleasure of carving pumpkins with Villafane Studios at Ludwigsburg castle in Germany and the previous year in Hong Kong. This year I am joining Villafane Studios once again in Carefree Arizona to create a new Halloween venue. You can also find me every weekend in October carving large pumpkin displays at The Bronx Zoo. This is Pumpkin Sculpt USA’s 4th year and we’re going bigger than ever! Lately I've been really enjoying working in sand. It's wonderful for building at a large scale relatively quickly. The poundup portion is a lot of work but there is no limit to what can be created other than the physics of the sand. My "claim to fame" used to be based on what clients I worked for. Initially, that was The Franklin Mint and later Disney and other major companies. Sometimes it was a well known toy line, like when I was working on Cabbage Patch Kids back in the 80's or more recently, a series of Harry Potter figures. Now It's based on my own work, and I try to keep it fresh and new so the pieces I am known for change frequently. My first big moment as an artist would have been when I was 15 and had a show of my paintings in The Congressional Offices. They were on display for a year. 2. Can you tell us a little about your art? 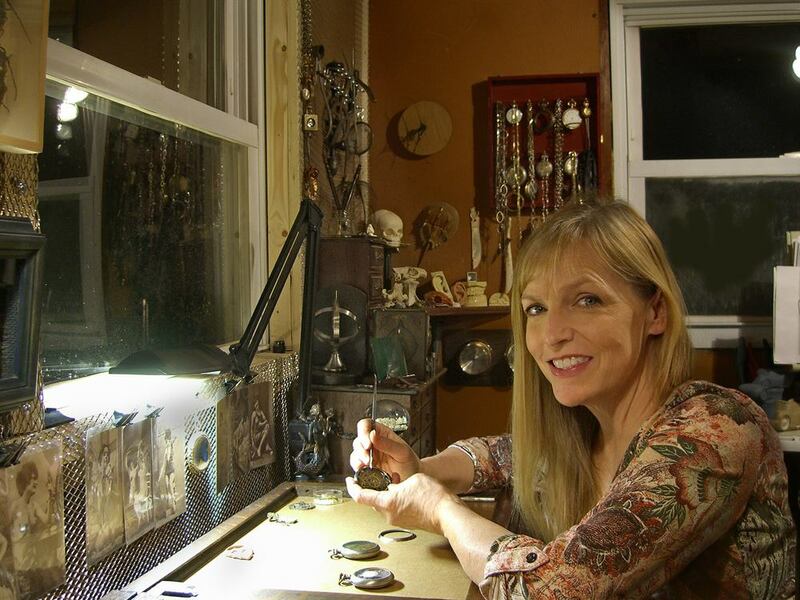 My antique watch parts creations began as a way of expressing my sense of time and mortality. Using non working pocket watches (I never destroy a watch that works) and thinking about the lives of the people who once owned them helped me to evaluate my own goals in life. I marveled at the beauty of these creations and considered how much care was put into each one. I wanted to honor the watchmakers and create pieces that could become cherished heirlooms once again. In the process, I found a way to transition from spending my time creating commercial products into a far more fulfilling creative outlet that brings joy to others. All Natural Arts began with sculptures that included natural objects such as insect wings, snake skins, feathers and other delicate items. Since sculptures made from these needed to be protected, I put them inside antique pocket watch cases. Often when I collected the cases I would also receive parts and noticed that they were quite beautiful. I began incorporating them into my work and soon they became the main material in my designs. As soon as I showed people my initial watch parts creations the reaction was dramatic. It was not long before I was getting more requests from those who wanted to purchase items and from places that wanted to put them on display. Word began to spread as images were shared on social networks and photo hosting sites and inquiries started to come in from all over the world. 4. You seem to create a lot of animal sculptures, why? I’ve always felt a bond with nature and creatures of all types and I love the dichotomy of creating biological forms using machine parts. There’s a special magic that happens when they reach the point where they feel as if they could actually exist. 6. Do you have a favorite piece? I’m in love with each one of them while I’m working on them but as soon as they’re done I’m excited about the next one.